Frederik Peeters’ graphic novel Pachyderme, reviewed. Inside a hospital where the dead talk and the doctors are as likely to seduce you as save you. A well-dressed young woman searches the halls of an ornate hospital for her injured husband. Instead she finds mystery: The woman who once kissed her; the babies she never had; a corpse who knows her address; a doctor who makes her blush but whose secret she’s determined to ferret out. Part Cold War espionage story, part Mulholland Drive, Frederik Peeters’ weird and beautiful comic Pachyderme moves with the logic of a dream. Is it a nightmare or a dream come true? Not until the final pages will you understand, and even then you might be pleasantly, profitably confused. Pachyderme, by Frederik Peeters. Published by SelfMadeHero. Swiss cartoonist Peeters, a winner at the 2013 Angoulême comics festival, is a budding cartooning star in Europe; this book, one of his first to be published in America, ought to make him better known in the U.S. art comics community. It’s funny and elegant and disturbing, and Peeters’ evocative artwork—inspired equally, it seems, by classic Hollywood and the great horror comics of mid-century—makes every page eye-catching. 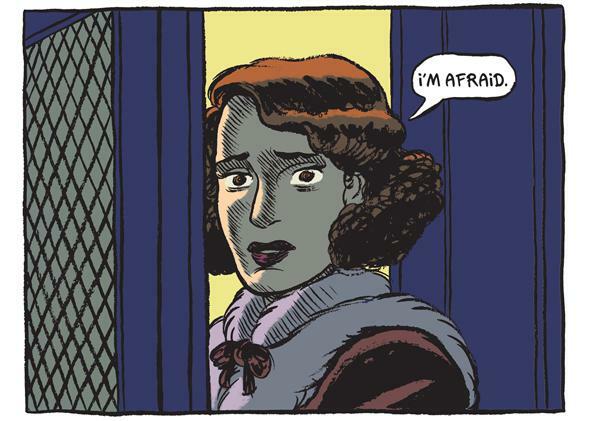 As brave Carice makes her way through the hospital and its surprises, Peeters’ panels make the uncanny (like a dead elephant in the middle of the road) believable, and the everyday (like the elephant necklace Carice wears) special. We’re very proud to have Frederik Peeters illustrating the December issue of the Slate Book Review. Pachyderme by Frederik Peeters. SelfMadeHero.